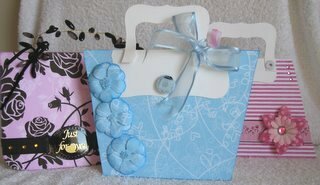 Make this Handbag card that every little girl will love. ...that every little girl will love. 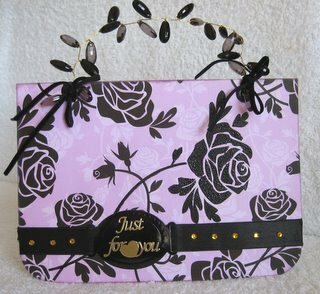 This Handbag Card is truly a "Girly" card and most little girls will be thrilled to receive it. 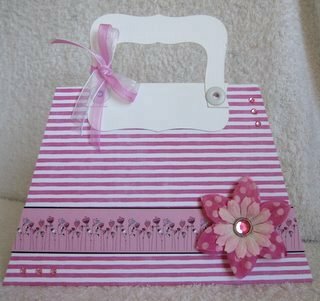 Making your own Template to create this Handbag Card is really very easy to do, and once you have it, it can be used time and time again. Make the card truly "Girly" by adding all the bling from your stash that you have. 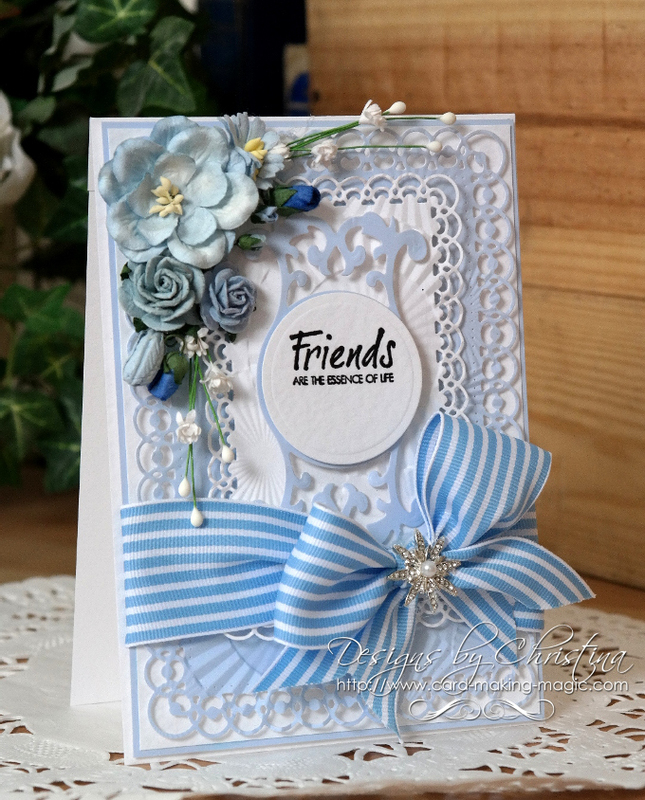 Any embellishment, from feathers to flowers will make this card something really special. Take you A4 card, and fold it it half. It doesn't matter if you measure in from the top or the bottom. It will produce a different angle to the bag whichever you do. You can decide how much to measure in, but make it the same on both sides, and mark lightly. This is the bit that can be removed to create the handbag card shape. Another alternative is to use a corner rounder punch, and just remove the bottom two corners. The photograph gives examples of each of these. 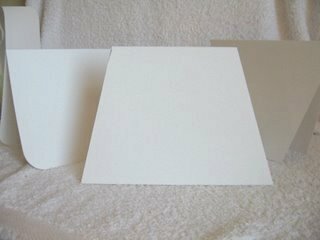 Cover the front of the card with the paper you have chosen. 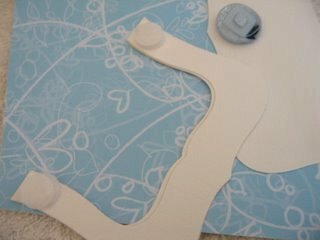 I find it easier to add the paper and then follow the shape of the card. I have added a panel to the top part of the bag to represent a closed flap. And glued a button to it. You can free hand draw a handle, or use a shape to trace around, or do as I did and use a die cut shape. Make two shapes for added strength, and glue them together. 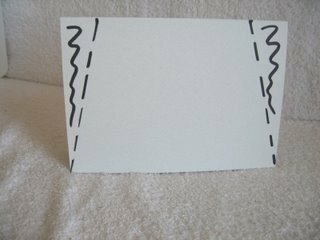 To make the card easier to add to a standard sized envelope, I added "Hook and Loop" to the handle. This means it can be removed to post, but don't forget to tell the recipient to replace it, or they will think it's not finished. 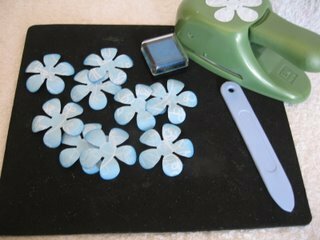 I have made flowers for my handbag card, and if you click here, you will see how to make them. ...and just to make them different I have added glue and some beads to the center. But you could add gemstones, pearls, buttons or paper flowers. The pink and blue bags are using the template in two different ways, both looking as good as each other. But this one is very glitzy. I have picked out the large central flower and embossed it using the same technique as in this Tutorial. I have threaded the velvet ribbon through a label and added gemstones to it. But the handle is truly Recycling. It is the wire and beads from a Christmas candle, you know the ones that are wrapped around it to make it look pretty. 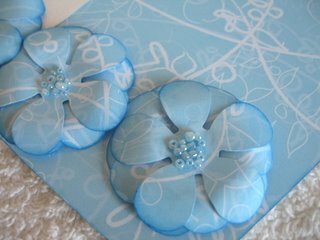 It is held in place by punching two holes at the top of the card and threading thin ribbon through them. They are then tied in a bow to hold the handle in place. Well who's a clever girl then?? ?